Imagine a microorganism that can clean up oil spills, an antibiotic that can be quickly altered to combat drug-resistant strains of bacteria, or a cancer vaccine that can help prolong human life. This is biotechnology. Biotechnology uses biological systems, such as bacteria, to create goods and services. And while it’s been around for thousands of years, our growing understanding of DNA has ushered this technology into an era of new discovery, resulting in endless possibilities for medical, agricultural and environmental applications. Today, the technology breaks down into many areas, including genetic engineering, cell culture, cell fusion, enzyme technology, and fermentation technology. From Banting and Best’s discovery of life-saving insulin in 1921, to the 1997 development of 3TC, an anti-viral drug used to prolong the life of people infected with the AIDS virus – Canadians have a long history of making headlines with their biotech discoveries. 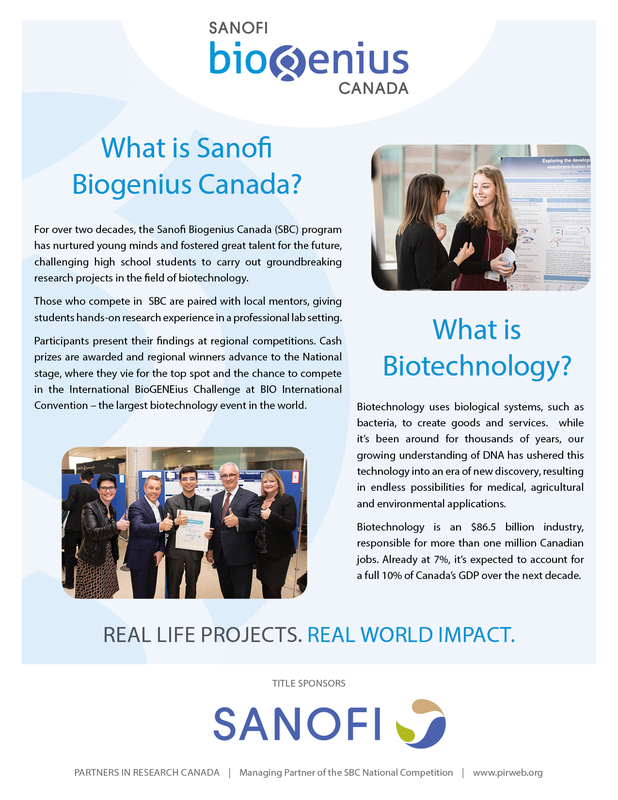 The SBC is continuing in this tradition, by helping to grow Canada’s next generation of biotechnology talent. Biotechnology is an $86.5 billion industry, responsible for more than one million Canadian jobs. Already at 7%, it’s expected to account for a full 10% of Canada’s GDP over the next decade. Realizing biotechnology’s economic potential depends on having a skilled, talented workforce. The SBC helps lay the foundation for that workforce by investing in the next generation of leaders – great thinkers, innovators and expert researchers who will shape the future of our country. A project is deemed relevant if its content relates to the various applications of biotechnology such as health care, agriculture and forestry, food processing, mining and the environment, etc. ; and it applies the knowledge and techniques of the current courses at school and/or other scientific studies such as biochemistry, molecular biology, cell biology, microbiology and biotechnology.